Follow along step-by-step as I help a reader through the calculations. In its simplest form, it's calculating how much you need for a unique patch in your design multiplied by the number of blocks it's in. Adding a bit extra for insurance. Then repeat for the rest of the patches in the quilt. It may be a lot of steps, but it's easy once you learn how! For a Triple Irish Chain quilt, checkerboard pattern, how much of a cream background fabric would I need for a king size quilt? Size does matter. But king size is only the first step in the information gathering process. To help you decide how big a quilt it takes to cover YOUR bed, I've put together a worksheet that captures all the information you'll need. Click here to download the "Worksheet for Calculating Bed Quilt Sizes". Next, we consider our design. In the Triple Irish Chain quilt family, we see that odd numbers of blocks in both the rows and columns are needed to create a symmetrical design. Decide on a technique. For this project, we'll strip piece when we can. Different techniques take different amounts of fabric, especially for triangles—but we don't need to consider that for our Irish Chain. The final crucial bit of information is to decide (or declare) the smallest or largest finished-size patch you'll work with. Lastly, write everything down and label it! Even with the best laid plans, things happen. We think we'll get to something right away, but we're interrupted. That's the story of my life. I've seen nurses carry around a piece of paper in their pocket and call it their brain. Well what's good enough for nurses is good enough for this quilter! Write things down! Usable width of fabric after the selvedge is removed is 40"
For a symmetrical Triple Irish Chain quilt design, we need odd numbers of blocks in both the rows and columns. With a grid size of 1" finished, our 7x7 block finishes at 7". (15 blocks x 7") x (13 blocks x 7") = 105" x 91"
**Rounded to the nearest odd number to create a symmetrical Irish Chain design. NOTE: This is pretty close to the size we were after (104"x93"). Certainly close enough for this example. 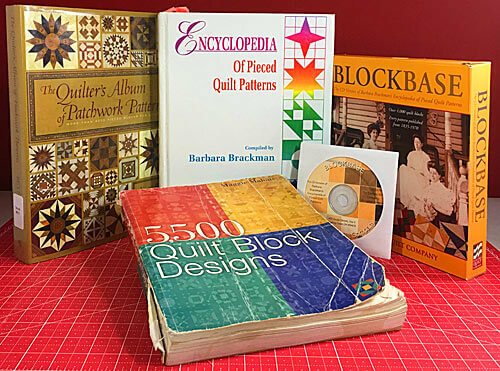 However, in making this quilt for your own bed, you may want to add borders, use wider bindings, add partial blocks or change the grid size to get an exact fit. 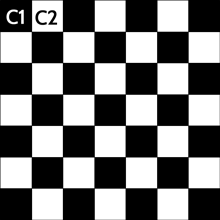 These are the two blocks that comprise the Checkerboard Irish Chain quilt pattern: Checkerboard (left), Alternate (right). Both are drawn on a 7x7 grid. Use the drawings above to find the dimension of each unique patch in 'grid units'. 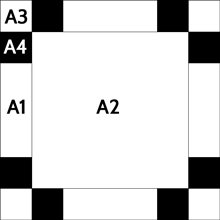 A1 (the side rectangle on the alternate block) is 1 unit wide by 3 tall. (1" x 1) by (1" x 3) = 1" x 3"
You must add 1/2" for seam allowances for a patch cut 1-1/2"x3-1/2". All the other patches in this block are squares so it's easy to choose the Cut Width. For A1, most would choose to cut it from 1-1/2" wide strips. I prefer to cut 3-1/2" ones because I'll be sewing that side 388 times. Lengthwise grain has virtually no stretch and makes for a truer seam. All 'Cut Width of Strip' measurements are in the chart in the first row highlighted in yellow. *We round down because quilts are made with whole patches. *We cut whole strips not partials. The '# of Strips to Cut' is the second row highlighted in yellow. 15 x 3.5" = 52.5"
Up until this point, everything has been specific and countable. It's a personal number. The extra you deem necessary may well be different than mine. I'll walk you through my estimates, but please revise them as you see fit! 2 x 1/4" = 1/2"
I always prewash. This Checkerboard Triple Irish Chain quilt has a whole lot o'piecing going on. Bleeding fabric is not an option after the quilt is finished—especially when it's got as much work in it as this. But the choice is up to you. 52.5" x .05 = 2.625" = 2-5/8"
These calculations are in the third highlighted yellow row in our chart. Step 6: Convert to yards and YOU'RE DONE!!! These totals are in the very last row. The generosity of your Fudge Factor is totally up to you. Those choices are up to you. The whole purpose of these calculations is to make sure there's ENOUGH fabric so that you don't run out during the quilt's construction. NEVER, NEVER, EVER be tempted to purchase the exact amount without a Fudge Factor added. That's just asking for headaches later on.